Even as Argentina has returned to a reasonable normality after the political and economic upheaval of 2002, one phenomenon that has endured is the presence of piqueteros (pickets) who block city streets, highways, and bridges to advertise their grievances. Public opinion polls suggest that Argentines are fed up with pickets, and the topic exploded onto the front pages yesterday when the Buenos Aires daily Clarín revealed that Gualeguaychú pickets (known as asambleístas) who have been blocking the international bridge to Fray Bentos, Uruguay, have been issuing "passes" that allow selected parties to cross the bridge. They have also collected "tolls" of up to US$100 for Argentine tourist vehicles to cross into Uruguay. The asambleístas have, for the last year or so, been blocking the bridge to protest against alleged pollution by a Finnish-built pulp mill, a topic on which I wrote in an earlier post. Recent developments are summarized well in an item in today's Mercopress (in English). The independent Buenos Aires newspaper Perfil provided some surprisingly positive coverage of the Botnia plant in last Sunday's edition, but unfortunately it's not posted to their website. Uruguay, for its part, is outraged not only that a vital international crossing has been blocked, but also that the Argentine government appears to have abdicated its own authority to control the border (even in the privatization frenzy of the 1990s, nothing quite like this happened). Argentine opposition figures have also been outspoken in their criticism of both the pickets and the government's alleged timidity. The Buenos Aires Herald has editorialized that "the government is tolerating flagrantly lawless behaviour which tramples on one of the most basic norms of Mercosur: the free movement of goods and people." This coming Monday, I will be hydrofoiling across the River Plate to Uruguay for several days. 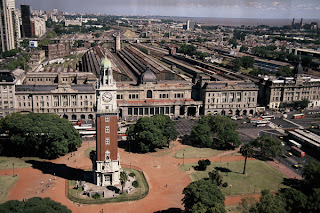 While the asambleístas were picketing Buquebus's Puerto Madero terminal--with greater government oversight and less disruption than in Gualeguaychú--I purchased a passage to the World Heritage Site of Colonia at the company's Recoleta offices. I may continue to Montevideo and Punta del Este, or else return to Buenos Aires and revisit Uruguay the following week. All of these destinations get coverage in my Buenos Aires guidebook; look here for updates. Seen from the air, the vast wild landscape of Torres del Paine makes it hard to imagine that, in the calendar year 2007, Chile's iconic national park received 128,402 visitors, nearly three-quarters of them foreigners. According to the Montevideo news agency Mercopress, so far this season, more than 1,000 visitors per day are flocking to see what, in my opinion, is at least a contender for the title of the "world's most beautiful mountain range." This, of course, means that the park's roads, trails, hotels, backcountry huts, and campgrounds are more crowded than ever. In an earlier post, I suggested that anyone intending to visit the park should book accommodations as far in advance as possible or resign themselves to camping (nothing wrong with that, but some people seem to have been counting on finding beds or bunks as drop-ins). The new statistics, hopefully, will be an additional incentive to make their arrangements early. In 1981, when I first hiked the Paine circuit, the park got only about 6,000 visitors per year. The route, which has changed since then because floods have destroyed some permanent bridges, was often faint. The infrastructure was minimal--hikers slept in tents, beneath rustic lean-tos and occasionally in outside houses that were still used by shepherds. It was often precarious, as the photo to your right would suggest. Once, as I forded the Río de los Perros, the current knocked me over and I lost a camera. Hikers were only a tiny percentage of the visitors, and few of them went far from the roads. In ten days on the trail, I met only three other people, two Americans and a Chilean (pictured above, Héctor Salas is still a good friend). As we all walked at roughly the same pace, we shared campsites and conversation every night. It was an intimate experience in a scenario of Andean grandeur. Nowadays, it could be argued, Paine's trails are approaching gridlock: On a recent two-hour hike in a rarely visited part of the park, I still passed at least 20 people. Still, while I cherish the memories of having Paine almost to myself in 1981, it would be hypocritical of me to begrudge latecomers their enjoyment of the park and its spectacular scenery. I'm one of those hikers, after all--but Paine now is the beaten track that it was once off. Paine deserves its celebrity, but intending visitors need to realize that Patagonia offers much more. In Chile's Aisén region, for instance, fairly few hikers enjoy the multi-day trek through Cerro Castillo National Reserve, which starts from the highway only an hour-plus south of the city of Coyhaique. According to Chilean government statistics, the reserve got only 613 visitors in 2007. Near the town of Chaitén, the ambitious private conservation initiative at Parque Pumalín is more accessible every day. In Argentina, Los Glaciares National Park gets its own traffic and lots of detours from Paine, but Perito Moreno National Park--admittedly harder to reach--is about where Paine was 25 years ago. The Argentine town of El Bolsón has spectacular hiking just minutes from its picturesque center. cars, trucks and their passengers back and forth between the hamlets of Pargua, on the mainland, and Chacao, on the big island of Chiloé. For a time it looked as if a suspension bridge might connect the two, but a US$700 million price tag pretty much eliminated that option. Now, according to the Santiago daily El Mercurio, the Norwegian firm Sweco Grøner has proposed a six-km tunnel to run 200 meters beneath the channel, at a cost of "only" US$300 million. For their own commercial benefit, salmon farmers and timber companies have long pushed for a ferry-free option, but the tunnel would also simplify tourist traffic. The proposed completion time is three to five years, but it's not obvious whether the Norwegians have experience in seismically active areas such as Chiloé. Nor is it clear what the islanders, many of whom were ambivalent about the bridge, may think about this project. It would almost certainly be a toll tunnel; passenger cars pay about US$16 at present for the 30-minute crossing. "Gated community" is an oxymoron--if fences or walls could create communities, Iraq's "Green Zone" would be a model for the world. Instead, these fences and walls, with their guarded entrances, often mark enclaves of fear and privilege, whether in the United States, Argentina, or elsewhere. In Argentina, most so-called "barrios privados" ("private neighborhoods," also known as "countries") lie in suburban Buenos Aires province, near towns such as Pilar. In reality, they've proved less idyllic than some of their advocates had hoped--while they're not crime-ridden, some high-profile crimes (including home invasions and murders) have taken place in them. For me, one of Buenos Aires's most appealing features has always been its public spaces, from the historic (if occasionally unruly) Plaza de Mayo to modest neighborhood squares. Near our apartment in Palermo, for instance, it's always been reassuring to see families with small children at the playground on Plaza Alférez Sobral, sometimes after midnight (Argentine parents are not obsessive about early bedtimes). Their very presence has been a strong indicator of confidence in the city's safety. In the past year, though, there's been a frenzy of fence building in the capital. It also coincides, apparently, with long-overdue park and plaza improvements. 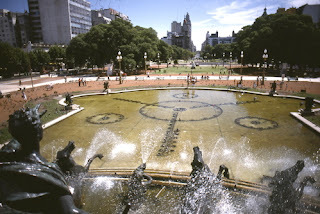 In the Plaza de los dos Congresos opposite the national legislature, for instance, the monument and fountain that symbolize the Andes and the Atlantic were once covered with paint, posters and grafitti. Now, protected by a three-meter fence, they're immaculate--but also inaccessible. Admittedly, fences may simplify maintenance, some public spaces need protection from vandalism, and others are special cases--the botanical garden, for instance, has long been fenced even though it also serves as a city park. Yet something feels wrong when the improved playground at Plaza Alférez Sobral is lifeless after the gates of the new two-meter fence surrounding the plaza are locked. And it's worse when locked gates, even in mid-afternoon, mean no one can enjoy the view over the fountains from a civic landmark such as the monument opposite the Congreso. It's a blow to community, or do you prefer the first view to the second? 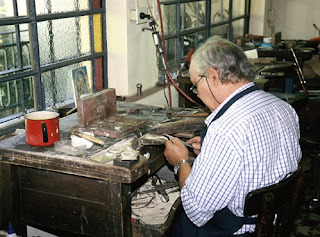 workshop of silversmith Juan José Draghi. It was a shock, then, when a friend emailed me that Draghi had suddenly died only three days later, at age 64. Draghi had invested time and money in an admirable facility that's helped put Areco on the map for visitors to Argentina. San Antonio has many outstanding silversmiths and other artisans, but the town and country will both miss him. Draghi's legacy will remain. After I sent a note of condolences, his daughter Lucila replied that the family, though in mourning, will continue with their father's project, which also includes a handsome guesthouse. A new website displays samples of the work. Not many people visited Belfast on vacation in 1978, but I did, and one of my lasting memories is the central city parking ban and the barriers that kept IRA car bombs from approaching public buildings. In Buenos Aires, similar barriers, sometimes camouflaged as planter boxes, have gone up outside Jewish community landmarks since the car bomb destruction of the Israeli embassy in 1992 and the AMIA cultural center in 1994. Fortunately such events are rare, and none has happened since then. Such barriers are common elsewhere in Buenos Aires, but have nothing to do with terrorism--except insofar as aggressive drivers terrorize defenseless pedestrians. According to the traffic safety organization Luchemos por la Vida, about 40 percent of Argentine traffic deaths are pedestrians, and it's likely that only a few are recklessly ignoring traffic. It's not uncommon to read of speeding buses or other vehicles leaping the curb and killing or injuring an unsuspecting pedestrian on the sidewalk. For this reason, many businesses, including corner cafés and restaurants in trendy neighborhoods such as Palermo Hollywood, have erected similar barriers. Some are planters, others concrete pillars, and others sunken steel posts (I've seen plenty of bent ones). Some are more aesthetically pleasing than others, but they all permit customers to enjoy their lunch, dinner, or drinks without being crushed by a careening truck that's run a red light. Barriers also limit property damage. Southern Cone exchange rates, about two weeks ago, it was around 500 pesos per dollar, but it has since gained about four percent to finish the day below 480. Chilean exporters (including the incoming tourism sector, which earns dollars but pays its local bills in pesos) are upset. In an interview in the Santiago daily El Mercurio, UCLA economist Sebastián Edwards (a Chilean) suggests the central bank should buy dollars (among other measures) to help reach an equilibrium of around 535 to 545 per dollar that he considers sustainable. How soon that might happen is uncertain, even as Chile becomes a costlier destination, but Edwards expects the peso to depreciate. Meanwhile, the dollar has strengthened a bit against the Argentine peso, at 3.14 versus 3.09 a couple weeks ago. The coin shortage remains acute, though--yesterday's Clarín chronicled a developing black market, in which a 100-peso banknote gets only 97 pesos in coins; in a twist, one corner kiosk operator is offering a free hot dog for every 50 pesos in coins. sometimes embrace the dead at the expense of the living. In a country where military conspirators abducted Evita's corpse to an obscure grave in Italy, and Juan Perón's hands mysteriously disappeared from Buenos Aires's Chacarita cemetery, strange things can happen. in the Franciscan church of Catamarca, about 1100 km northwest of Buenos Aires. The heart had been on public view until about about 6:30 p.m. Tuesday, when a vandal shattered the glass case (pictured above) with a rock and absconded with it. This is not the first time the heart's gone AWOL--in 1990, it briefly went astray but was later found on the adjacent monastery's roof. Update: Late Wednesday afternoon, Catamarca police arrested a 21-year-old Mendoza man in the theft, but there's no word yet of the heart's whereabouts. Further update: As of Thursday morning, January 24, Catamarca police had interrogated the suspect, who admitted having been in the church but denied having taken the heart, which is still missing. His fingerprints were apparently on the glass case, but there are many contradictory stories making the rounds. Many Argentines consider Juan Perón a demagogue (or worse), and his political legacy is mixed (at best). The labor unions he encouraged could make Jimmy Hoffa's ethically challenged Teamsters look like Common Cause. It was Perón and the unions, though, who helped transform Mar del Plata from an elite enclave into an affordable Atlantic beach resort that more nearly reflects the diversity of Argentine society. both elbows, and long lines of diners wait outside restaurants. This has been a particularly strong season despite rising hotel prices, but some middle-class vacationers have found a way to manage costs: they're staying at labor union hotels built during the Peronist heyday. According to an article in Monday's Clarín, half the guests in union hotels this season are not union members (members have priority, but the hotels accept non-members on a space available basis). While these hotels might not have the luxuries of higher-priced accommodations, they're well-kept and unpretentious, and cost about half what a comparable private hotel does (members pay only a fraction of what non-members do, however). Regular hotel owners, however, are complaining of unfair competition, as union hotels are exempt from many taxes that others pay. I've always shied away from union hotels, as in the recent past some had become rundown and, in any event, Argentine prices were so low that I wasn't worried about the cost. Given recent inflation, though, I may well choose one when I next update my Argentina guidebook--but I'll still go in November or December, before the crowds hit. The city of Gualeguaychú, a few hours north of Buenos Aires in Entre Ríos province, is known for its raucous Carnaval--it's not Rio de Janeiro, but it's the next best thing for anyone who can't afford going to Brazil. For the last 14 months or so, though, it's been in the headlines because local protestors have blocked the bridge crossing to the Uruguayan city of Fray Bentos. Fray Bentos, which was the site of the internationally known Liebig meat packing factory for more than a century until its closure in 1979, is home to a new pulp mill built by the Finnish company Botnia. It's a complex story that could fill a doctoral thesis, but the gist is that Gualeguaychú's activists claim that the plant will pollute the Argentine side of the Río Uruguay and beaches on which the city's tourist trade also relies. Both Botnia and Uruguay deny this, and of course the plant has provided many jobs in Fray Bentos. Uruguay, for its part, argues that blocking an international border is illegal, but the Argentine government has shown little interest in breaking the blockade. It has, though, taken Uruguay to the International Court of Justice to present a case against the mill; Uruguay, in turn, has appealed to Mercosur, the South American common market to which both countries belong, to end the blockade. The blockade is costing Uruguay money, as the buses and private automobiles that bring Argentine visitors during the summer tourist season cannot use the bridge, and alternative overland routes are far more time-consuming. Pulp mills, of course, have a reputation for environmental contamination. Finland, on the other hand, has a reputation for state-of-the-art technology and especially for openness--it fact, the country sits atop Transparency International's annual anti-corruption rankings. It's worth adding that Transparency International also ranks Uruguay highly, second only to Chile in Latin America. In another interesting survey, Finland came in fourth of 149 countries in Yale University's Environmental Performance Index, while Uruguay came in 36th. Argentina came in 38th, just ahead of the United States. concluded that it was built to stringent European standards. The protestors, though, brusquely declined the invitation, and the blockade is likely to continue at least through the southern summer. For travelers, this will mean continued pressure on Buquebus catamaran and ferry services from Buenos Aires to Uruguayan destinations such as Colonia, Montevideo, and Punta del Este, so they should make reservations as far ahead as possible. An alternative is the Cacciola catamaran from Tigre to the Uruguayan city of Carmelo. In Argentina's hyperinflationary past, its printing presses produced prodigious quantities of banknotes that lost their value almost as quickly as they went into circulation. Today, ironically, money supply problems are occurring at the opposite end of the spectrum: the government seems unable to mint enough coins. Argentina's smallest banknote is for two pesos (the peso is worth about 3.1 per dollar); there are coins for five, ten, 25, and 50 centavos, and for one peso. Coins are essential for riding the bus in Buenos Aires (the basic fare is 90 centavos, payable in fare machines that do not take bills). Businesses from corner kiosks to restaurants and others are constantly reminding their customers to pay with exact change. Even toll collectors on cross-country highways may ask for exact change. Today, when I went to get a photocopy enlargement of a map (90 centavos), the cashier pleaded with me to withdraw the two-peso note I offered him and pay with a peso coin. His business, he said, could use 500 pesos worth of change per day, but they're hard pressed to get 50 pesos worth from the bank. Fortunately, I still had sufficient coins to pay for the downtown bus I needed, but the shortages are getting critical. When is a Citibank not a Citibank? even quasi-criminality. In the days of "parallel exchange rates" (read: black market), changing travelers' checks was particularly nightmarish--I have memories of ducking into a dark back office on Buenos Aires's Florida pedestrian mall where we would nervously sign over our checks and get many more pesos or australes, far more quickly, than we would have gotten in the bank. ATMs, of course, have made travelers' checks almost obsolete, and black markets have essentially disappeared in the Southern Cone (they did make a brief reappearance during Argentina's 2002 crash). In spending five months or so every year in Argentina and Chile, with occasional forays into Uruguay, I carry a dollar reserve for emergencies but generally rely on ATMs to get cash. Occasionally there are glitches--when I was in Argentine Tierra del Fuego in November, an Internet outage meant that no ATMs were working and I had to make an emergency run to an exchange house in order to pay for a tank of gas. For most of the past several years, I've used a Citibank ATM card because the company's widespread presence meant I could withdraw money without paying for ATM use (though Citibank always collected a now-rising percentage per transaction). On reviewing my bank statements during the last couple years, though, I would find charges of US$1.50 per withdrawal from a "non-Citibank ATM," even though the line above it might say "Citibank, Olavarría, Argentina." Charges would accrue in Chile as well as Argentina. Back in California, I would go to my local Citibank branch, where a manager would apologize and void the charges. Having to do so was an annoyance, but it will never happen again. That's because, shortly before I left California in late October, we received a postal notice stating that Citibank would soon collect ATM fees for all overseas branches, which are not considered part of Citibank in the US. This is exclusive of the foreign transaction fee, which is rising to three percent (from a previous one percent). It might not be fair to single out Citibank, as the proliferation of similar fees has become rampant in both the US and other economies. One month in Buenos Aires, when we got our Fibertel cable TV/Internet bill, a friend warned me that Fibertel had started to collect an additional monthly charge for its program magazine. By canceling the magazine, which we never read, we were able to avoid a de facto rate increase. US author Bob Sullivan has chronicled the widespread imposition of such fees, and how to avoid them, in his book Gotcha Capitalism. I've done my part by closing that Citibank account, at least. I now use a credit union ATM for my foreign exchange transactions--credit unions are far more consumer-friendly than multi-national banks. The other day I recounted the experience of taking a bus out of Retiro to San Antonio de Areco, but said little about San Antonio itself. In fact, it's one of my two or three favorite excursions for first-time visitors to Buenos Aires (the others are Isla Martín García, in the Paraná Delta, and Uruguay's World Heritage Site of Colonia del Sacramento). San Antonio is 113 km west of Buenos Aires via Ruta Nacional 8, about two hours from Retiro if all goes well, but it feels like a different world. On its northern outskirts, buses, trucks and cars race by on the heavily travelled highway, which continues toward Río Cuarto and eventually intersects Ruta Nacional 7 to Mendoza. Slow-paced San Antonio, though, is a throwback town where motorists usually cede right-of-way to pedestrians--unheard of in Buenos Aires--and most hotels provide their guests bicycles for getting around. 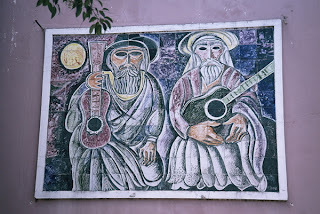 Signs of San Antonio's gaucho heritage are all around, from horses and horsecarts to tiled murals. In November, it hosts the Fiesta de la Tradición, several days of gaucho-centric festivities that fill all the town's accommodations and others for miles around. Argentines romanticize their gaucho heritage much as Texans do their own cowboy history, even though many San Antonio's visitors are Porteños who have never lived outside Buenos Aires. San Antonio is also home to a critical mass of skilled silversmiths and other craftsmen (and women) whose custom work is in demand around the world. The best place to see them at work is the museum/workshop of silversmith Juan José Draghi, who has clients from around the world--no bargains here, but the craftsmanship is remarkable as the mate gourds in the accompanying photograph would suggest. San Antonio retains a representative sample of colonial buildings and many more 19th-century brick Italianiate structures, some of which have been recycled as cafés, restaurants, antique shops, and crafts outlets (again, no bargains but good values in leather and other media, in addition to silver). Some visitors may find it a little too precious, but it's tasteful, with little or no kitsch. The irony, of course, is that many if not most of the artists and crafts workers promoting the gaucho tradition have Italian immigrant surnames. All Aboard? to Rosario and Córdoba? As I mentioned in an earlier post, Argentina's passenger rail system has been disastrous for 30 years or more, but that could soon change. According to this morning's La Nación and other Buenos Aires newspapers, a French group will soon start construction on a bullet train to link BA with Córdoba via Rosario and four other cities. When the project is completed, within three years, the train will cover the 710 km to Córdoba in about three hours (compared with eight or nine hours by bus, at present). A dedicated Buenos Aires station will be built at Retiro, alongside the existing stations for the Mitre and Belgrano Norte lines (depicted in the photo above). Argentines have an almost romantic devotion, seemingly a collective memory from their early 20th century prosperity, to their passenger rail system. It's often misplaced, as the handful of surviving lines are economically unviable without huge state subsidies, and the service is appalling. In principle, though, the new line makes economic sense, as it would link Buenos Aires with two populous metropolitan areas that both aspire to the title of Argentina's "Second City." It could also make air service from BA to Córdoba obsolete--the elimination of airport hassles would make train travel time competitive with flying--and thus free up additional planes for other domestic destinations. Until it's up and running, though, it'll be hard to say whether the results justify the promise. While I generally regard Argentine long-distance bus services highly, it's hard to say the same about Buenos Aires's superannuated bus terminal at Retiro. In the first place, access is awkward--when I took a cab from my Palermo apartment around 9 a.m. yesterday, half the 20-minute trip was spent negotiating the perpetual bottleneck in the last few blocks to the terminal. Of course, there are city buses, but they leave you beyond comfortable walking distance if you have baggage; the Subte, meanwhile, requires changing trains (baggage, again, can be a problem). On the other hand, I showed up at the Nueva Chevallier ticket counter and learned that a bus for San Antonio de Areco, the gaucho capital of Buenos Aires province, was due to leave in ten minutes--no waiting, or so I thought. I paid my 21 pesos (US$7) for the two-hour trip, and headed for the departure bay. Retiro is old and worn, but that's really where the problems start. It's also congested, both with buses and people. According to Chevallier's staff, the bus would arrive somewhere between Dársena (Platform) 25 and Dársena 36, and would display a sign for Río Cuarto (or Río IV), its ultimate destination, in the window. Buses normally don't pull in until just a couple minutes before their departure time, a fact which has always caused me anxiety. The most modern buses have digital readouts so it's relatively easy to figure out their destinations, at least when the drivers bother to flip the switch on or to change them. Some just scribble the destination on a scrap of paper, in unreadably light pencil, and tape it to the window. As buses are pulling in and out all the time, you have to scramble back and forth the 50 or so meters between the extremes of your designated platforms, dodging others who are doing the same thing or else standing and blocking the way, to find out if your bus has actually arrived. In fact, a loudspeaker announces the arrival and departure of all buses, but the rumble of idling diesels makes it difficult to hear. Even when it's audible, it's often unintelligible--I speak Spanish well, and my wife is a native speaker, but even she finds the sound quality so poor that it's almost impossible to decipher what's being said. If your Spanish is marginal, it's hopeless. I've never missed a bus at Retiro, but this time I was concerned. After half an hour, the Río Cuarto bus hadn't shown and I worried that, in pacing back and forth, I might somehow have missed it. Keeping one eye on the platforms, I re-entered the building and approached the Chevallier counter, where they assured me it was about to arrive. It another 15 minutes it did, and we boarded, about 45 minutes behind schedule. Then, settling into my seat, I read the paper as we headed west to Areco; en route, highway construction delayed us further, so arrival time was an hour and a half behind schedule. That, though, was atypical and won't deter me from taking buses in Argentina. I hope, though, that someday city authorities manage to undo the Retiro bottleneck. When angry passengers rioted at airport delays in Buenos Aires a couple days ago, the Buenos Aires Herald came up with the best headline: "The Latest Rage." In another incident, a train en route from Mar del Plata to Buenos Aires suffered an unexplained four-hour delay in the early a.m. before arriving several hours late with similarly irritated customers. In reality, air traffic has been erratic for some years, and train service has been unreliable at least since the 1970s. It's been almost that long since I've taken a train in Argentina, except for suburban commuter lines in the vicinity of Buenos Aires. Long-distance buses, meanwhile, carry far greater numbers of travelers far more efficiently, to more destinations, and for that reason I'm going to address that topic today. For most Americans, at least, bus travel is almost literally below the radar--it would hardly occur to anyone from a car culture to take a long-distance bus when it's possible to fly. Partly, I think, this is class-based: in the U.S., bus passengers are widely perceived to be undesirables, people with whom, say, BMW owners would rather not associate. In a practical sense, it's also true that services are infrequent and often inconvenient, and routes limited. I have occasion to drive from Oakland to Los Angeles once or twice a year on heavily traveled Interstate 5, and I've never seen more than one Greyhound en route in the six-hour drive (In Argentina or Chile, over a comparable distance, I would see many dozens if not hundreds of buses). Last year, though, when a U.S. tour operator consulted me about taking a group from Bariloche, in the Patagonian lakes district, to the coastal city of Puerto Madryn, I recommended chartering a bus rather than flying. My reasoning was thus: because there are few flights between Argentine cities without passing through Buenos Aires (the de facto hub), his group would waste most of a day in airports, backtracking from Bariloche to Buenos Aires, and then waiting in BA for the connection to Puerto Madryn (presuming they arrived in time to make the connection). Chartering an overnight bus, by contrast, would mean his clients could sleep aboard (saving the cost of a hotel room, incidentally). They would arrive rested and ready to sightsee at Península Valdés, with its penguins, sea lions, and elephant seals. I will reassure skeptics that it's possible to sleep on board. 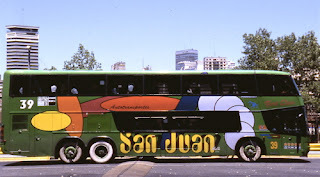 In both Argentina and Chile, the best buses are spacious double-deckers with three wide seats, instead of four narrow ones, per aisle; there are two seats on one side of the aisle and one on the other. Those seats recline almost horizontally--rather like business-class seats in an airplane. Meals are served on board or, if not, they make regular meal stops. While few travelers might care to endure the 40-hour marathon from Buenos Aires to Río Gallegos, or its 26-hour Chilean counterpart from Santiago to the Peruvian border, for overnight trips such as Buenos Aires to Córdoba or Santiago to Pucón, these buses are ideal. Schedules are frequent and fares are moderate. One drawback, though, is the near universality of cell phones, which might ring when you'd prefer to sleep. In researching and updating my books, I normally travel by car because I need to visit some really off-the-beaten-track sights in a short period, but I do take buses on occasion. I've almost always been satisfied with the service but, that said, there are some complications about which I'll say more in another post. Argentine highway safety is a serious problem, and one that concerns me the moment I step out my door of my apartment building. I try not to exaggerate, though, so it's hard to accept the sensationalist coverage, in this morning's Clarín, of a head-on crash that killed 13 people in Córdoba province. According to a sidebar to the story, 81 Argentines have died so far this year in vehicle crashes. As deplorable as that may sound, it's possible to consider this good news: In 2007, more than 8000 people died on Argentine highways, an average of roughly 22 per day; in the 13 days so far this year, the average is only six-plus per day. Should this trend continue through the year, highway fatality rates would decline by about 70 percent, so let's give Argentine drivers credit for getting off to a positive start in 2008--especially when so many are en route to their vacations. Still, the carnage on Argentine highways is real enough without Clarín's alarmism over a single accident that may have been caused by a blown tire. It's worth noting, though, that 33 of those 81 fatalities so far have happened in Córdoba province, a popular vacation destination for Argentines. The situation at Ezeiza, Buenos Aires's international airport, is apparently returning to normal after some of the 5,000 passengers booked on various Aerolíneas Argentinas flights responded to lengthy delays by vandalizing the airline's check-in facilities; other indignant clients even forced their way into the immigration area. Flights were delayed anywhere from seven to 24 hours, while Aerolíneas declined to provide vouchers for anything other than snacks. Aerolíneas officials blamed the problems on a strike by labor intransigents, who in turn proclaimed that there was "shortage of staff"--explanations that are not mutually exclusive. In reality, there's plenty of blame to go around, though it's clear that Aerolíneas (with the bulk of market share) has the most problems of any Argentine airline. I addressed the topic of domestic flight problems, due to a shortage of planes, in an earlier post. Meanwhile, today's Buenos Aires Herald contains a large advertisement recruiting cabin staff for Austral, Aerolíneas' domestic affiliate (any distinction between the two is more or less fictitious). In additional to fluent English, one of the basic requirements is the ability to swim. It might not look like much, but the dumpster to the right is one of the most encouraging sights I've ever seen in Buenos Aires. In the aftermath of the 2002 economic meltdown, desperate cartoneros (informal recyclers from the poor suburbs, so called because cardboard is one of their preferred materials) invaded the city in search of materials they could sell to help themselves through the crisis. In the process, they would rip open the plastic bags of household refuse that Porteños leave nightly on the curbside before city trucks could haul them away, and scatter them everywhere. Despite the economic recovery, some cartoneros even scavenge food from restaurant refuse, and the practice is not likely disappear soon. Stray dogs, not to mention rats and cockroaches, make a potential public health hazard even worse. Two years ago, when I last visited Montevideo, it was clear that the Uruguayan capital had found at least a partial solution to the problem. On almost every block I saw, the city administration had placed such containers and its own cartoneros could rummage through them for recyclables without scattering their contents. Like Montevideo, Buenos Aires at least has started to work toward cleaner streets, without penalizing the poor for their activities. Progress in providing containers, though, has been slower than some of us might like. In "Palermo Hollywood," the neighborhood where I took the photograph above, a woman carrying out her garbage confirmed that the cartoneros no longer fling the trash in all directions and that the streets are cleaner, but the process hasn't been without disruptions. "There are a lot of bars in this neighborhood," she told me, and "sometimes the kids here take the containers for rides after they've been partying." At least inebriated dumpster-divers aren't getting behind the wheel of an automobile. In the 1970s and 1980s, the Southern Cone countries were the world champions of inflation. In the midst of political turmoil and economic mismanagement, Argentine prices often increased 50 percent per month. This created a scenario in which saving was pointless since, by month's end, their money would lose half its value. Instead, Argentine consumers quickly spent their salaries on essentials--food, for instance--and durables (automobiles, say, but even items such as refrigerators which held their relative value). 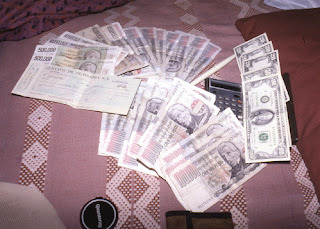 When my wife and I got married in Argentina in 1981, we received 3.6 million pesos in cash and checks as wedding gifts (see the accompanying photo; as we were moving to California, we asked people to refrain from refrigerators to avoid baggage surcharges). This we quickly changed for about US$700, which seemed a lot of money at the time. As the peso deteriorated and a black market for dollars developed, the handful of tourists not deterred by military dictatorship lived like kings. Civilian government returned in 1983, but manic price swings continued--while spending several months in Buenos Aires in 1985, I sent friends in California million-peso notes, which were by then worth less than a dollar, as Xmas gifts. Finally, in 1989, then President Carlos Menem pegged a new peso to the dollar and reasonable stability reigned for a decade-plus (though the currency peg created longer-term problems). Chile, too, underwent hyperinflationary episodes and painful readjustments, both during and after the Salvador Allende years; in some cases professionals were earning just a few dollars per month. Leaving aside the issue of the Pinochet regime's ability to impose economic orthodoxy and repress labor unions, Chile has managed to avoid such crises since the mid-1980s, even after the return to civilian rule in 1989. Argentina, of course, has not been so fortunate, as the 2001-2 crash drove half the population into poverty. Under former President Néstor Kirchner and his successor/wife Cristina Fernández, the recovery has been impressive, but it's not been problem-free. In both countries, one of those problems is inflation. In Argentina, after the peso collapse, the government froze bank accounts, along with many prices, but with annual GDP in the nine percent growth range, it's hard to resist pressures from both business (to liberate the market) and labor (to raise wages). I haven't time right now to address complex policy questions such as energy supplies and costs (which I've dealt with elsewhere on this blog), but for the moment it's enough to say that prices for many goods and service are rising (see, for instance, my separate entry on public transportation in Buenos Aires). Prices are rising in Chile as well, but the cases are not exactly parallel. Chile, for instance, imports nearly all its fossil fuels, whose cost is about double that in Argentina (which has been self-sufficient until relatively recently). This has been a major contributor to a 2007 inflation rate of 7.8 percent--high by recent Chilean standards, but hardly hyperinflationary. The independent central bank anticipates a four percent figure for 2008. Argentina's inflation rate is a controversial topic. The government publicly claims 8.5 percent for 2007, but has been accused of meddling in the ostensibly autonomous state statistics agency INDEC--much as the Republican Bush administration prevented the US Census Bureau from using advanced statistical techniques to arrive at city population figures that might have tilted redistricting in favor of the opposition Democrats. According to an article in today's Clarín, internal government documents use 14 percent as a base inflation figure for 2008. Meanwhile, in the travel and tourism sector, other factors are at work. In Argentina, the dollar is holding its own at about 3.1 pesos, though travelers with euros, pounds, and other strong currencies are gaining. With a relatively weak peso, Argentines are traveling outside their borders less frequently than in the past; instead, they're competing with foreign visitors at popular destinations such as Patagonia and Iguazú Falls, where the increased demand means higher local prices. The Chilean peso, by contrast, is strong. Only a couple years ago, it was nearly 700 pesos to the dollar, but windfall copper prices have earned an abundance of dollars and the exchange rate has fallen below 500 pesos. Domestic inflation apart, this would mean price increases of more than 25 percent in dollar terms; in practice, it's not quite so extreme, but the trend is clear. Meanwhile, plenty of Chileans are traveling outside their own borders (in fact, they're among the pressures driving up prices in the Argentine tourism sector). Neither of these trends necessarily means a return to the nightmarish 1980s, but they do mean that that neither country is the cheap destination that both were in the recent past. In general, for most travel and tourism services Chile is now dearer than Argentina. The gap, though, is not so great as it was a couple years ago. Not so long ago, entering any Argentine cafe or restaurant, especially in Buenos Aires, meant exposing yourself to toxic tobacco clouds of Parisian proportions. The city that painted itself as the "Paris of the South" was a free-fire zone and, when I first came here in the 1980s, smokers lit up in cinemas, theaters, and just about anywhere else with impunity. Nearly all my wife's family and friends smoked heavily (she herself quit shortly after moving to California); when we would visit their apartments for dinner, I often had to flee to the balcony for an oxygen hit. Most of those family members and friends quit sooner or later, but it still seemed inconceivable that stopping smoking would become public policy. After all, a survey just a few years ago reported that three out of ten Argentine cardiologists smoked! As of March 2006, though, Buenos Aires City Ordinance No. 1799 prohibited smoking in schools, hospitals, and other enclosed public places; following a seven-month grace period, the measure applied to restaurants, bars, cinemas, theaters, shopping centers, and similar sites. What's impressive is not the legislation per se, but the degree of enforcement and compliance--even though Argentines often evade the intent of unpopular laws, there seems to be a consensus that smoking is unhealthy and inappropriate behavior. That's not to say that smoking has disappeared. Since smokers may still light up at sidewalk tables or on patios, they often congregate there so that, paradoxically, indoor air quality can be better than outdoors. There is also an exception for large locales able to create an effectively segregated indoor smoking area. It bears saying, meanwhile, that my observations may not apply to working-class neighborhoods that foreigners and tourists rarely visit. For most visitors, there's little reason to visit outlying barrios such as Liniers, where compliance may be lower. For that matter, I've even seen policemen and others smoking in the Retiro bus terminal where in principle it should be illegal; once, at the city airport, a taxi driver got hostile when we asked him to put out his pucho (a lunfardo or slang term for a cigarette). Still, both the city and the country deserve credit for rapid progress in controlling tobacco abuse, and the percentage of Argentine smokers is decreasing. Neighboring Chile has been less successful. It's enacted only a half-hearted tobacco law that lets restaurants determine whether they want to permit smoking or not; if they do permit smoking, they may not admit customers under age 18, though some have created tobacco-free areas that comply with the legislation. Bars and discos are still tobacco-friendly, and Chile has one of the highest smoking rates in the Americas. Yesterday, January 8, more than 100,000 pilgrims swarmed to a sprawling shrine just outside the Corrientes provincial city of Mercedes (population about 30,000) to remember the gaucho Antonio Gil. Gil, according to legend, was a Robin Hood figure who was unjustly executed in the 19th century but has survived in Argentine folk consciousness, especially among the poor and dispossessed. All year, there's a steady flow of kneeling, miracle-seeking visitors in economic distress, and others who come to offer thanks--and bring gifts--for favors already granted. They lug home souvenirs that are numerous and often huge--including life-size or larger plaster statues of the "Gauchito" (known affectionately by his diminutive). Since the Argentine economic disaster of 2001-2, impromptu red-flagged Gaucho Gil shrines have proliferated alongside highways from the Bolivian border to the tip of Tierra del Fuego. In fact, the Gauchito has moved into the top echelon of Argentine folk saints with San Juan province's Difunta Correa, whose own roadside shrines are distinguished by plastic bottles filled with water. Legend says the "Difuntita" died in the desert following her draftee husband during the 19th-century civil wars, but her baby survived at her breast. There is no evidence whatsoever for this, but believers have made the Difunta's home shrine near Vallecito even larger than Gil's at Mercedes. Devotees of both the Gauchito and the Difuntita consider themselves genuine Catholics and see nothing contradictory in their beliefs. The official Church thinks differently, though some of its more open-minded priests have tried to come to terms with ineradicable popular beliefs whose strength and durability are a mirror of the Church's shortcomings. Argentine directors Ricardo Becher and Tomás Larriñaga, meanwhile, drew parallels between the 19th century and the present in their 2006 film El Gauchito Gil: La Sangre Inocente (Gauchito Gil: Innocent Blood), whose trailer can be seen on YouTube. For what it's worth, a Chilean rock band goes by the name of Difuntos Correa. For many years, the travel and tourism sector in Puerto Natales has complained over the lack of direct air services from Santiago; until now, visitors to Torres del Paine and other nearby attractions had to fly to Punta Arenas, which is three hours away by bus or car. Recently, however, Sky Airline began flights from Santiago, and Air Comet is due to begin them next Saturday, January 12. Natales's airport runway is too short for the bigger jets, which may be one reason why the flagship airine LAN has no apparent plans to land here, but the new services will add flexibility to Patagonian travel plans. Sky's flights from Santiago stop in Punta Arenas before continuing to Natales, three times per week. From Natales, the flights continue nonstop to Santiago. Air Comet will be flying Saturday and Sunday, but the routing is not yet posted on their website. Both services should also link up with Navimag ferries and Skorpios cruises to the nearby glacial fjords such as Pío XI (pictured above), and are likely to be seasonal. Air Comet is considering flights to Easter Island, which would be LAN's first commercial competition to the World Heritage Site, known from its iconic moai (statues). It will have to avoid conflict with LAN's schedules, however, on the five-hour flight from Santiago. 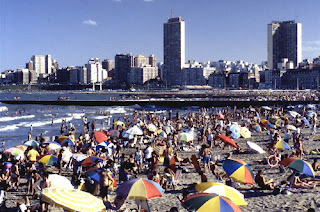 Before the economic meltdown of 2001-2, Argentine vacationers flocked to Chile, especially to the "Garden City" beach resort of Viña del Mar, for their summer holidays. Even though the Pacific Ocean is much colder, and Viña's Mediterranean climate is much cooler, than their own Atlantic beach resort of Mar del Plata, Argentines still overran Viña every summer. All that changed with the peso collapse and subsequent banking restrictions that, for several years, kept the great majority of Argentines within their own borders. In fact, the flow of tourists reversed as Chile's appreciating peso made Argentina, and particularly the nearby city of Mendoza, a bargain destination. Many Chileans flew to Buenos Aires for the weekend, and Mendoza province tourism authorities openly invited Chileans to spend their mid-September patriotic holidays in Mendoza--the rough equivalent of Mexicans campaigning for Americans to celebrate their Fourth of July south of the border. In some ways, it might have been considered the "Revenge of the Chileans," after so many years of the annual Argentine invasion. Chileans are still flocking to Argentina but, in what might be the clearest signal yet of the Argentine economic recovery, the online Santiago Times has reported that 100,000 Argentines are expected to spend their vacations in Viña and vicinity this summer. Even though the Chilean peso remains strong, more than 20,000 Argentines crossed the Libertadores pass over the Andes from Mendoza into Chile in the last week of December. The more northerly beach resort of La Serena is also getting many Argentine visitors. This morning's Clarín contains an article on four-wheel ATVs in the Buenos Aires province beach resort of Pinamar, where an ordinance does not allow such unstable vehicles to circulate on city streets but only on designated circuits. Leaving aside the question of how many helpless sunbathers they might run over on the beach, only one person may ride each vehicle and that person must wear a helmet. The article's accompanying photo, though, shows a helmetless driver, with a bareheaded boy on his lap, on a heavily trafficked avenue. After being cited by a municipal inspector for having no vehicle registration or license , and his helmet hanging on his elbow, one indignant rider responded that "I'm on vacation, man, and all you do is hassle me." With 8,000 ATVs for rent in Pinamar, and only 30 inspectors, the overwhelming majority of violations go unpunished. In fact, ATV companies even rent to minors, though the the provincial traffic code prohibits this. Several years ago, one Buenos Aires daily described Argentina's highways as the theater of a "Guerra del Tránsito" (Traffic War). Editorial writers regularly deplore the slaughter on the country's roads, and 2007 statistics suggest there's been no cease-fire. According to the daily Clarín, more than 8,000 people died in traffic accidents here last year, and the death rate of 28.5 per 100,000 inhabitants was higher than every other country in the hemisphere except for Mexico (28.9 per 100,000). By way of comparison (or rather, contrast), consider the figures for Brazil (18.5), Uruguay (17.2), the United States (15.0), and Chile (13.1). Most local analyses, though, tend to place the blame on infrastructural or technical problems such as lack of freeways or the presence of older and unsafe vehicles. They're not wrong per se: narrow two-lane roads (many of them poorly maintained) can be dangerous, and I've seen vehicles with neither headlights nor taillights puttering along them. Those analyses, though, regularly ignore an apparently uncontrollable epidemic of reckless, aggressive driving, and an almost total lack of professional law enforcement. It would be unfair to say that all Argentines drive badly, but enough of them do so that driving here can be an anxiety-filled experience: high-speed tailgating is rampant, for instance, and almost everybody ignores no-passing stripes. The police, meanwhile, rarely patrol the highways: in all my years, I can count the number of cars I've seen actually patrolling on one hand, and I've never seen anybody stopped for a moving violation. The police do, though, set up checkpoints at key highway junctions. On occasion, they may detain a drinking driver, but more often they engage in meticulous document checks and uncover minor equipment defects--say, a malfunctioning blinker--that they see as opportunities for coimas (bribes). The Buenos Aires provincial police are notorious for this. Motorcyclists are an issue in their own right. In theory, there's a national helmet law; in practice, I estimate compliance at about 10 percent. Among those who have helmets, more than a few carry them on their elbows--raising questions about the size and location of their brains (then again, perhaps the law only requires them to wear helmets, without specifying where). Yesterday a friend sardonically suggested that the only motorcyclists who wear helmets are motochorros--purse-snatching thieves who can't be identified as they escape on their bikes. To my mind, though, the greatest concern is small children. It's not unusual, especially in poor northern provinces such as Catamarca and La Rioja, to see a helmetless family with two infants on an underpowered scooter--a multiple fatality-in-waiting should they lose their balance and fall in front of a passing car. Meanwhile, and especially in the city of Buenos Aires, pedestrians are second-class citizens. In fact, my usual advice to visitors is to realize that, as a pedestrian, you are invisible--if you doubt that, just try to make eye contact with any porteño driver. Other things being equal, motorists may prefer not to collide with another vehicle, but they appear utterly unconcerned about flattening a pedestrian. At crosswalks, even at the handful that have been touched up in the last several decades, intimidated pedestrians wait nervously until all vehicles have passed. Once, when I asked a city policeman if he ever stopped and ticketed vehicles that sped through crosswalks, his snarling response was "That's not my job!" On the other hand, jaywalking is epidemic. My theory is that, since motorists almost universally disregard foot traffic, able pedestrians cross wherever and whenever there's an opening, at the corner or midblock, with or against the signal, even on the 12-lane nightmare that is Avenida del Libertador. That said, in nearly 20 years of driving in Argentina, with more than 200,000 kilometers on various odometers, I've successfully avoided any traffic accident, though I've had some close calls. As a pedestrian (for what it's worth, I don't drive in Buenos Aires proper), I've also managed to avoid becoming a statistic in the traffic war. Tom Buschor tells me that Llaima is quiet, but the park itself is closed for the time being. He's had some drop-in guests because of the eruption. According to Tom Buschor, proprietor of the Suizandina guest house at Malalcahuello, only about 35 km northeast of Llaima, the volcano has calmed down considerably. Tom has posted some photos of the eruption, as seen from his property, at the Suizandina website (www.suizandina.com). There remains, though, some concern that snowmelt associated with the eruption could cause flooding. The Río Captrén, a tributary of the much larger Cautín north of the park, seems most at risk. Border crossings to Argentina, at Icalma and Pino Hachado, have seen little ashfall and remain open. According to Buenos Aires's Volcanic Ash Advisory Center (VAAC), Llaima's ash plume at one point reached an altitude of about 12.5 km (about 41,000 feet) above sea level. It's always easiest to take unpopular actions at a time when people are distracted by other priorities. Thus public transportation prices in Buenos Aires are going up for the first time since December 2000, a year before the Argentine political and economic meltdown of 2001-2. Prices for a single trip on the Subte (Underground) will increase from 70 to 90 centavos, while basic bus fares will go from 75 to 90 centavos and suburban rail fares will go from 50-55 centavos to 60-65 centavos. Since most Porteños (residents of BA) take their vacations in January, there's likely to be little protest in a city that's known for its protests. That said, by almost any standard, public transportation here is extremely cheap. The Subte fare, for instance, is now about 29 US cents, while a comparable fare in the Chilean capital of Santiago is nearly three times higher, at about 84 US cents. It's also frequent and abundant; while the Subte closes around 11 p.m., buses run all night and, even at 3 or 4 a.m., it's rare to have to wait more than 10 or 15 minutes. City streets can be slow at peak hours, though, and many passengers have to ride standing up at those times (so do Subte riders, for that matter). Meanwhile, we had our first power outage of the summer today, as temperatures rose above 35° C (about 95° F), but it lasted only about an hour. It's supposed to rain tomorrow, and Friday should be cooler. Meanwhile, I'm heading out to buy ice cream, as BA has some of the world's best. In fact, as I headed to the corner for ice cream, it had already started raining, with lightning but no thunder, at around 9 p.m. local time. It would be great to have rain all night and a cool fresh morning. The first details are sketchy, but Chile's Volcán Llaima, east of the city of Temuco and about 700 km south of Santiago, has begun to erupt. In the Conguillío National Park, Llaima's lava flow has cut the road from the park headquarters to the north side town of Curacautín and may have reached Laguna Captrén. About 150 tourists have been evacuated, but emergency officials have so far classified this as a yellow alert, one step below the maximum red alert. 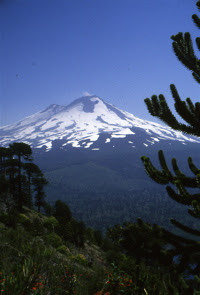 According to the Smithsonian Institution's Global Volcanism Program, Llaima is one of Chile's largest and most active volcanoes. "Frequent moderate explosive eruptions with occasional lava flows have been recorded since the 17th century," so this eruption seems to be no cause for panic. In the short term, though, it's probably advisable for intending visitors to postpone trips to the park and its immediate vicinity. Across the border, in Argentina's Neuquén province, westerly winds have carried enough ash from Llaima that Aerolíneas Argentinas postponed flights from the airport at the city of Neuquén. Paleontology, particularly dinosaur studies in Patagonia, is a field in which Argentines scholars have excelled in recent years. Much of the country was, in remote times, home to some of the world's greatest dinosaur specimens, and museums both in Buenos Aires and the provinces are doing an excellent job of communicating their findings to the public. Over the last few days, I've been reading Walking on Eggs (New York, Scribner's, 2001), by Luis Chiappe and Lowell Dingus, about their discovery of huge caches of dinosaur eggs in Neuquén province. Even more importantly, they discovered dinosaur embryos within those caches, which provided even greater clues as to dinosaur evolution. Without going into great detail at this point, I'll add that Dingus and Chiappe (an Argentine who is head of the Dinosaur Institute at the Los Angeles County Museum of Natural History) have written a book that manages to communicate their findings with enthusiasm in accessible language. I'll also add that that I had the good fortune to meet Chiappe several years ago, briefly, as he was doing a dig in Sierra de las Quijadas National Park in San Luis province (an area that resembles the canyonlands of Utah). He was very approachable, more than willing to take time to answer what, for him, must have been extremely basic questions about his work there. Many years ago, as I was growing up in Tacoma, Washington, I lived barely a block from the Fort Lewis army base. In fact, I lived near the little used portion known as North Fort Lewis where, on occasion, GIs went on training exercises. As kids, my friends and I used to explore the woods there and, often finding foxholes, we would pretend we were soldiers. Often we would find items, such as ammunition boxes, that we would take home as souvenirs. Once I found an M-80 firecracker, used by the U.S. Army to simulate battlefield explosions, but illegal for civilians since 1966. The M-80 is a cylindrical firecracker about 1.5 inches long and just over half an inch wide, with its fuse coming out the side rather than the end. Most of the fuse on mine had already burned but, when I brought it home, I decided to set it off in the back yard (my parents were not home). At least I was not so foolish as to light it while it was in my hand--even more clueless adolescents have lost fingers or hands from M-80s--but when it went off I was barely a few feet away; the explosion was powerful and the noise was deafening. In was so loud, in fact, I was surprised the police or fire department didn't come; since then, I've been very wary of fireworks. 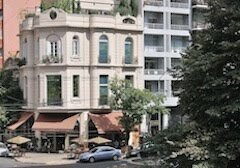 In Buenos Aires, my wife and I own an apartment in a sedate middle class neighborhood near the botanical gardens and the zoo. Last night, though, was New Year's Eve and, at midnight, explosions far stronger than anything I recall from my own M-80 went on for at least an hour; in corridors between tall apartment buildings, the effect mimics a war zone. In reality, Argentina's unregulated fireworks market probably brings explosives far more powerful than the M-80 into the hands of adolescents (and others) with impaired judgment (not necessarily caused by consumption of alcohol or other mind-altering substances). Having seen firecrackers tossed from ninth-floor apartment balconies into the street, I no longer leave home on New Year's Eve when I am in BA--it's just not safe, in my opinion. On Christmas, some 75 people, most of them under age 15, were admitted to Greater Buenos Aires hospitals with fireworks injuries. The photograph that accompanies this blog entry, of a poster that appeared on city streets at year's end, at least shows that the Justice, Security and Human Rights Ministry recognizes the problem--it implores people not to purchase fireworks, and to report illegal fireworks, even if no one appears interested in impeding their manufacture and sale. An update as of early afternoon: according to the daily newspaper La Nación, 82 persons have sought treatment in city hospitals today for injuries relating to fireworks--and uncorking champagne bottles. More than half sought burn treatments, while others had bruises and eye injuries, but none of either was apparently considered serious. Thus the city proper seems to have gotten off lightly, though there's no word from Greater Buenos Aires, the provincial suburbs beyond the capital's boundary.